Luxury farmhouse perfect for groups up to 18 persons, ideal for family reunions or weddings, which can be celebrated in the lush green garden. Private swimming pool overlooking the vineyards with breathtaking views of Tuscany nature and the olive groves of the owner. • The villa offers a fully equipped kitchen, a large open space room with dining area, living and chilling corners, separated by terracotta arches. There are 8 bedrooms and 8 bathrooms. • Internet Wi-Fi, Air Conditioning and Sat TV are included. Upon request local tours, cleaning service, cooking service or breakfast. 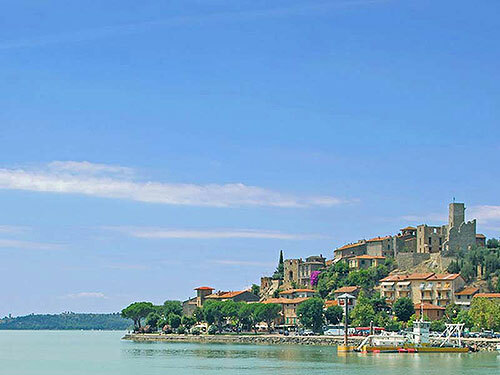 The next town is Castiglion del Lago on the Trasimeno lake. The lake was 500.000 years ago a Tyrrhenian Gulf, which thanks to the lowering of the sea level, became today a lake. The water level in the lake changes slightly from year to year because the lake receives water only from the rain and has no outlet, besides an artificial one constructed by the Romans to avoid floods. This lake is a perfect location on summer for bathing, sunbathing, windsurfing, sailing, fishing, or rent a motor boat and explore the islands on the lake. You should have definitely a delicious meal at one of many fish restaurant around the lake. There are 3 Island in the middle of the lake, which are worth a visit. 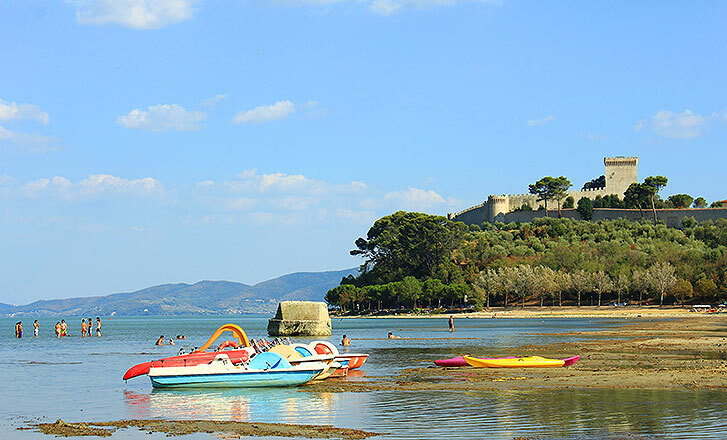 Castiglion del Lago was back in the centuries the 4th Island, it was a fortress built by the marquees Castiglioni. Today is a cozy town overlooking the lake, with delicious restaurants, shops, banks, pharmacies and everything you will need. Villa Trasimeno is a splendid, typical Tuscan farmhouse completely restored preserving all original features and tastefully furnished with the classic Tuscan style. It is immersed among the rolling hills of Trasimeno. This villa is ideal for several families traveling together, looking for a delightful vacation immersed in the real Tuscan lifestyle. Completely surrounded by a huge park composed of a wide green meadow, many olive plants, local plants and herbs like rosemary and sage, the villa is very secluded and offers breathtaking views over the Trasimeno Lake hills covered of vineyards and olive groves all around. The location is ideal for many kinds of day-trips: cultural -, historical -, or wine tours matched with delicious food, sport and much more, for example: Cortona, (30 min drive) a lovely medieval hill town, scenario of the movie “Under the Tuscan sun”, famous for its wine (Sangiovese, Syrah, Merlot, Cabernet Sauvignon). 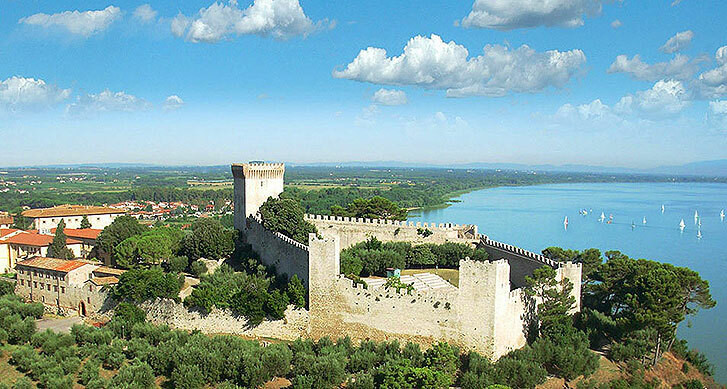 Castiglion del Lago, (6 min drive) with its fortress, overlooking the Trasimeno lake, here you can have a nice dinner at one of its delicious fish restaurant. Montepulciano, (40 min drive) famous for one of the oldest Italian red wine “Nobile di Montepulciano”. 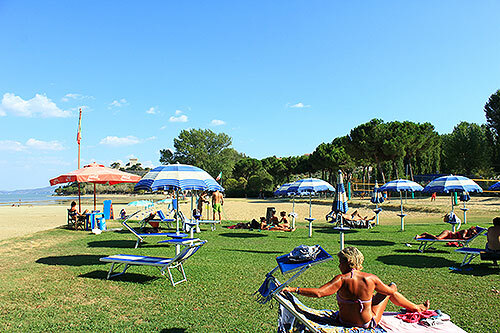 Immersed in this lush park, right in front of the villa, there is a large swimming pool, 11x7 heated by solar panel, equipped with many sun beds and umbrellas. There is a covered terrace next to the pool overlooking the rolling hills, equipped with chairs and chairs perfect to enjoy the sunset with your glass of wine, or to have outdoor meals. On the ground floor there is a bedroom with air conditioning and en-suite bathroom. It has a double bed which can be spitted into 2 twin beds. The brand new toilets are equipped with air dryer, sink, WC, bidet, shower, soap and towels. On the groud floor there is a second toilet for weelchair users. From the dining room there is a staircase that leads to the first floor, here you will find immediately a cozy sitting room with a second television, in case someone wants to watch something different. There are also some sofas in front of an arched window overlooking the Tuscan nature, just like a painting, you will be amazed from its beauty. On this side there is another bedroom with a double bed and a single bed, overlooking the swimming pool, with en-suite bathroom. All bedrooms have air conditioning and all bathrooms are equipped with hair dryer, towels, shower, WC, bidet, sink. The kitchen is on the ground floor and can be accessed by the living room or from the outside terrace. The eat-in kitchen is fully equipped with all modern appliances and all necessary utensils, cookware and tableware. There are 2 refrigerators with freezer box, 2 gas stoves, 2 electric oven, microwave, double stainless steel sink, 2 dishwashers, bread toaster and American coffee maker. Here you will find as well an open fireplace perfect for a BBQ. The ground floor has a cozy sitting room with fireplace made of local Serena stone, a comfortable corner to sit either alone or with your love or family in total relax, being warmed by the fire and why not, sipping a glass of Sangiovese. Even during low season you can enjoy your vacation here, as you can easily reach the cultural and art city close by, like Cortona, Firenze, Siena, Arezzo, Montepulciano and much more. From the living room there is a second staircase which leads to the left swing on the first floor. Here there are 6 bedrooms, one has a double bed and a single bed, the other 5 have double beds which can be spitted into twin beds if necessary. Each bedroom has its bathroom, with hair dryer, WC, bidet, sink, towels, soap and shower. Each room has been furnished with ancient wooden pieces of value, terracotta floors, terracotta ceilings or the apparent original wooden beamed ceilings. To describe this villa as beautiful is an understatement!!! Staying here was the perfect ‘trip of a lifetime’ vacation! All 16 of us were completely enchanted by the house (each bedroom different and lovely)...... great dining areas inside and outside, include a professional kitchen and several lovely sitting ares and the gorgeous and well kept grounds (lots of room to wander and relax, and a GREAT pool). Every one of us would highly recommend this to anyone who wants their Italian home base to be a glorious villa. Angela was gracious and welcoming, and helped us with anything we needed help with, including pre-stocking the kitchen, setting up a multi-course welcome dinner for 16, and arranging a local wine tasting on short notice. Not only would all 16 of us highly recommend a stay here (more than 5 stars! ), each and every one of us would LOVE to come back again someday for another trip of a lifetime! P.D. U.K. It is important to mention that when booking a rental via the web you do not always get what you think you're booking. This is not the case here. The house and grounds exceeded all expectations. The manager, Angela is very friendly and incredibly helpful. We gathered here for a family retreat and were thrilled with every detail. The furnishings, the grounds, the architecture, everything was exquisite! George T. D.